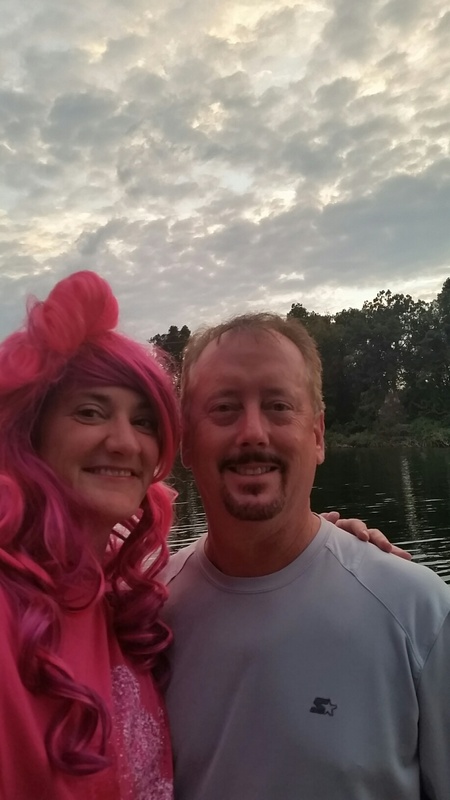 Meet Ginger Brooks-Komen Ozark BigWig and 8 Year Survivor! 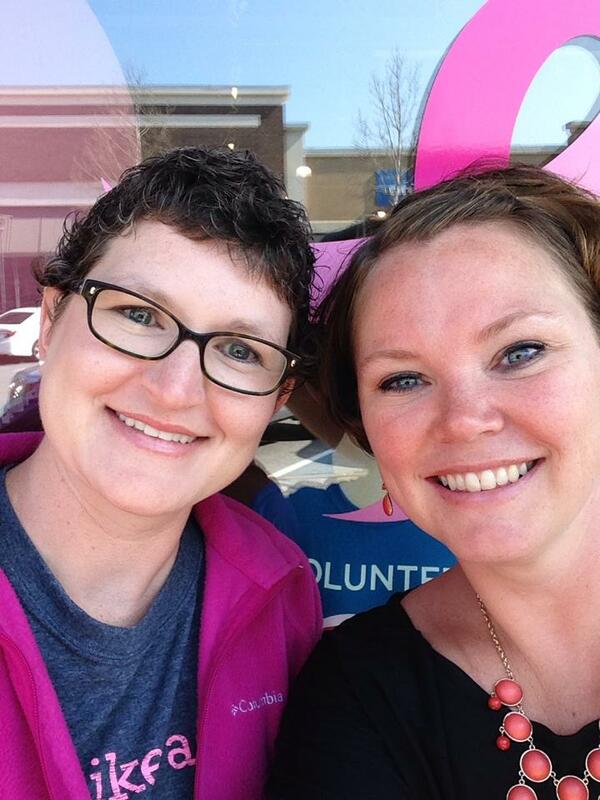 Komen Ozark is proud to feature one of our BigWigs and Breast Cancer Survivor, Ginger Brooks! 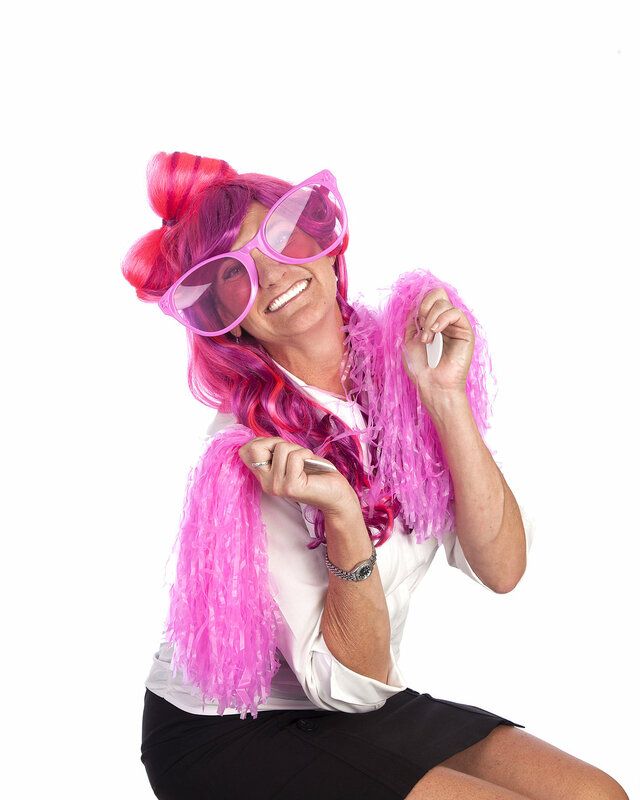 Come cheer on Ginger and watch the other 9 BigWigs walk the runway at the Pink Ribbon Luncheon on Friday, October 2 from 11:30-1pm at the Northwest Arkansas Convention Center in Springdale. Tickets are still available at http://www.komenozark.org. A Mammogram saved my life! You never know how you will react when you hear the words “You have cancer”. I had thought about this before, and thought that I would not be able to handle it. But on August 27th, 2007 (my son’s 11th birthday), I heard those words, and after shock and tears, we (my family and friends) put on our boxing gloves and went on to fight! I had had mammograms before, and with dense breasts, I always got called back. In 2007, I was late getting my mammogram appointment scheduled and my husband, Chris kept urging me to get it. Well, they called me back for a second mammogram, and then back again for an ultra-sound, because the radiologist “didn’t like what he saw”. Well, that turned out to be a Stage 1 diagnosis, caught early. I had an MRI to ensure there was only 1 tumor and I was a great candidate for a lumpectomy. Unfortunately, we didn’t get clear margins and went for a second lumpectomy 2 weeks later. The pathology report showed that not only did I not have clear margins again, but a second tumor was found. 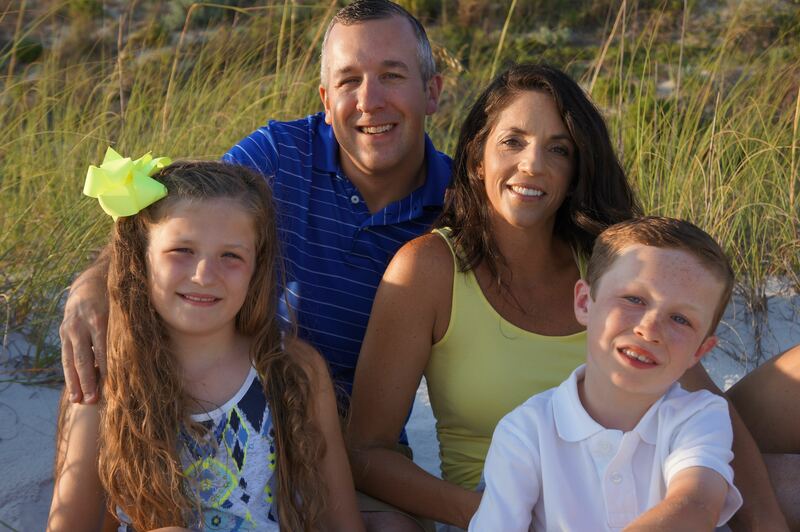 After much prayer and research, we decided that a double mastectomy was right for us. We also research post treatment options, chemo, tamoxifen and determined, along with my doctors that 5 years of tamoxifen was right for me. In 2014, I opted for a full hysterectomy to fully protect myself and starve the cancer out! I have been cancer free 8 years now and feel very fortunate that we had great doctors, an observant radiologist, and very good medical coverage. It is important to be a participant in your care, understand your diagnosis, and enlist your friends to help! It takes an army of friends to help you and your family through the process. I was fortunate to have family, friends and co-workers at my side through the entire time! I am very passionate about everyone being screened, but not everyone has access to the care that I did and Komen helps fill that gap. I am also passionate about finding a cure. 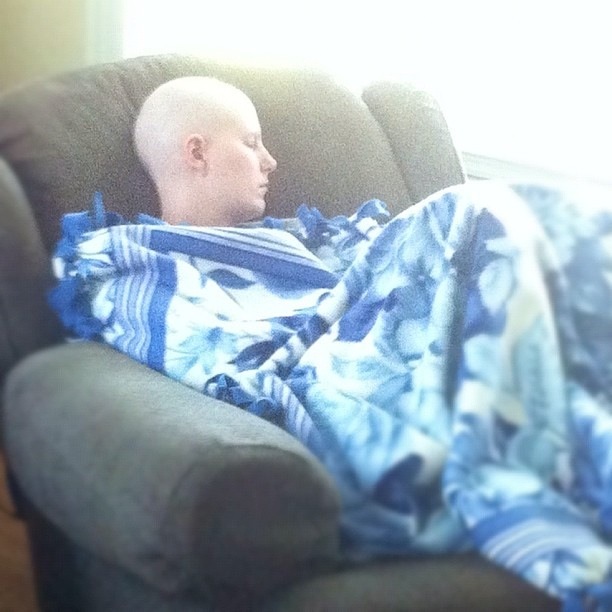 I have a close friend who was diagnosed 2 weeks before me, she battled for over 5 years, but she lost that fight. I also, have a younger sister and 9 year old niece, both will be watched carefully. I pray that my niece will NEVER have to worry about battling this terrible disease. So when I was asked to be an inaugural BigWig, I jumped at the chance! I took my BigWig to Facebook and email, and literally around the world! What a better way to spread the word, that we can save lives and find a cure!!! Don’t go it alone. Your family and friends want to help, let them! 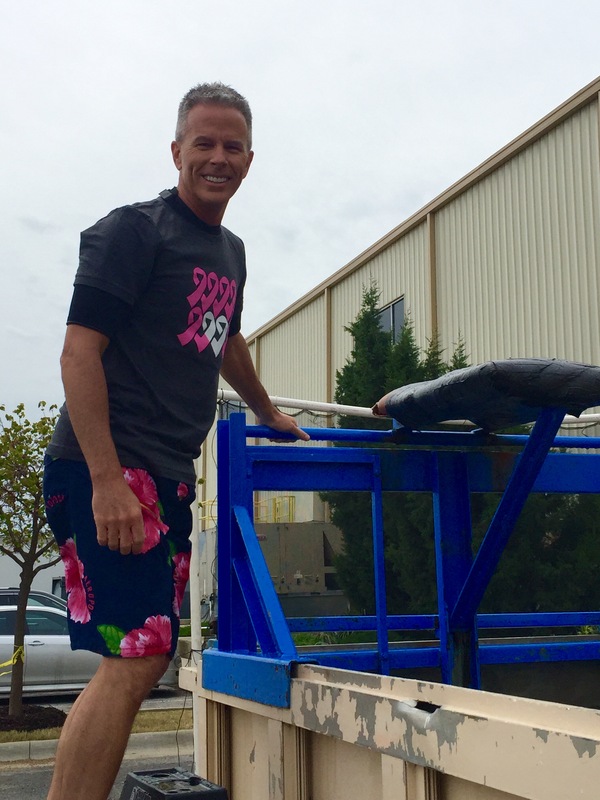 Support Komen as they research for a cure! 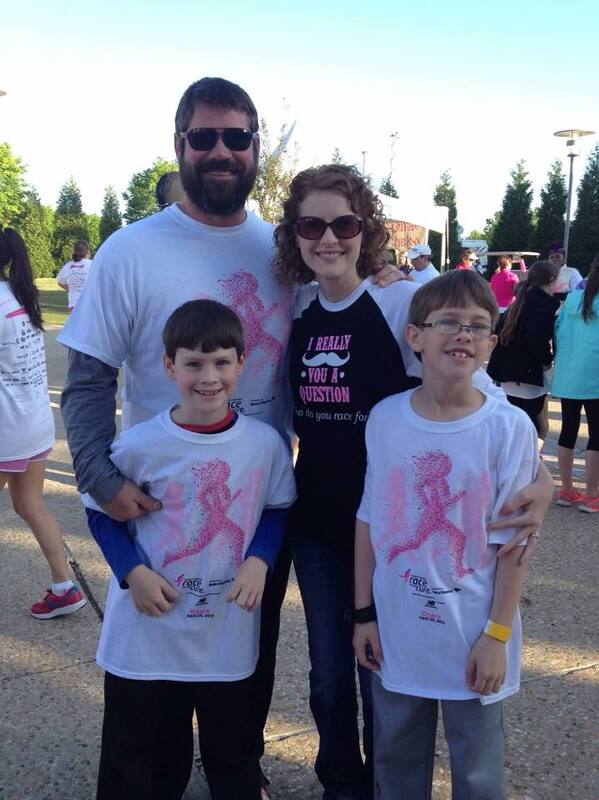 The winner of the Terri’s T-shirt Contest at our Race for the Cure is Team Jennifer! 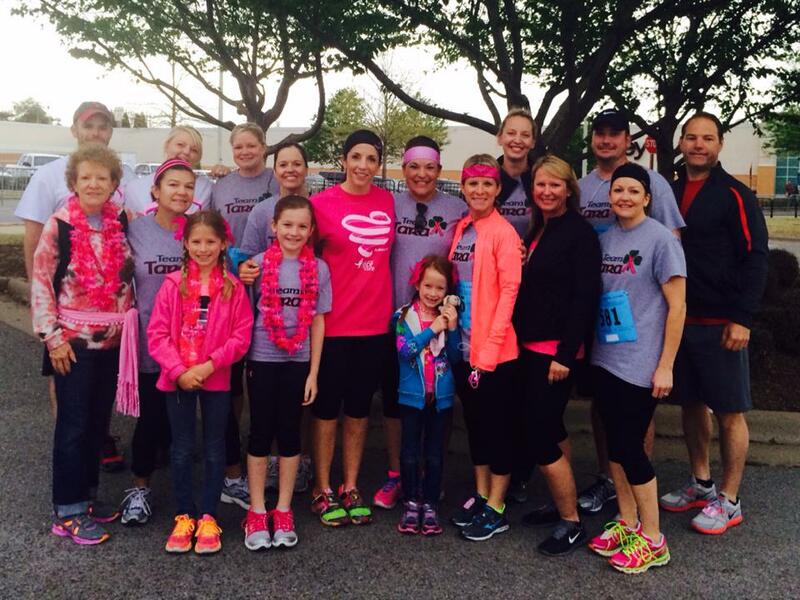 Jennifer Snow Bryant is a breast cancer survivor and the inspiration behind Team Jennifer. We reached out to Jennifer to share her story. I was diagnosed at 35 after finding a lump on my left breast. My sons were 3 & 5 at the time. I was stage 1, grade 3. I had a double mastectomy, 4 rounds of chemo and 6 weeks of radiation. I found out I have the brca 2 gene so I chose to have a hysterectomy to avoid ovarian cancer. I had capsular contracture (from radiation we believe) on my left side and didn’t heal well due to radiation. This also led to a strep b infection that made me very ill and resulted in removing my implant and later having the latissimus flap surgery. My journey started in October 2010 and ended (if it really ever ends) in November 2012. I can’t imagine taking this journey without the best Doctors, nurses, family and friends in my life. No one would obviously choose to go through anything like Breast Cancer but if they do, I wish everyone had the experience I had! I would also like to add that my Delta Zeta big sis, Lori Walker, always helps me with the shirts. Her mom passed away from Breast Cancer so it was a cause close to her heart before I was diagnosed and now she is a huge supporter for me as well. Congratulations Team Jennifer on winning the Terri’s T-Shirt Contest! 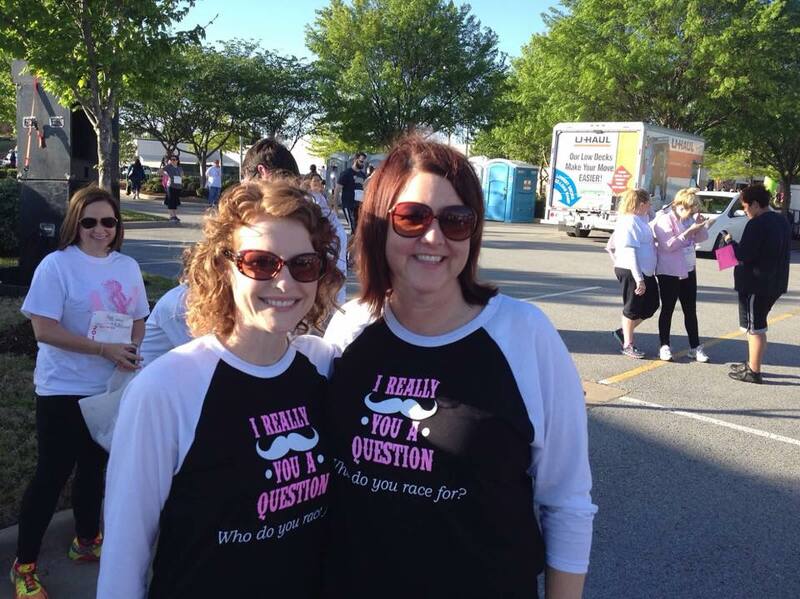 *Each year, Komen Ozark hosts a Team T-shirt Contest to award the most popular t-shirt from the Race for the Cure. 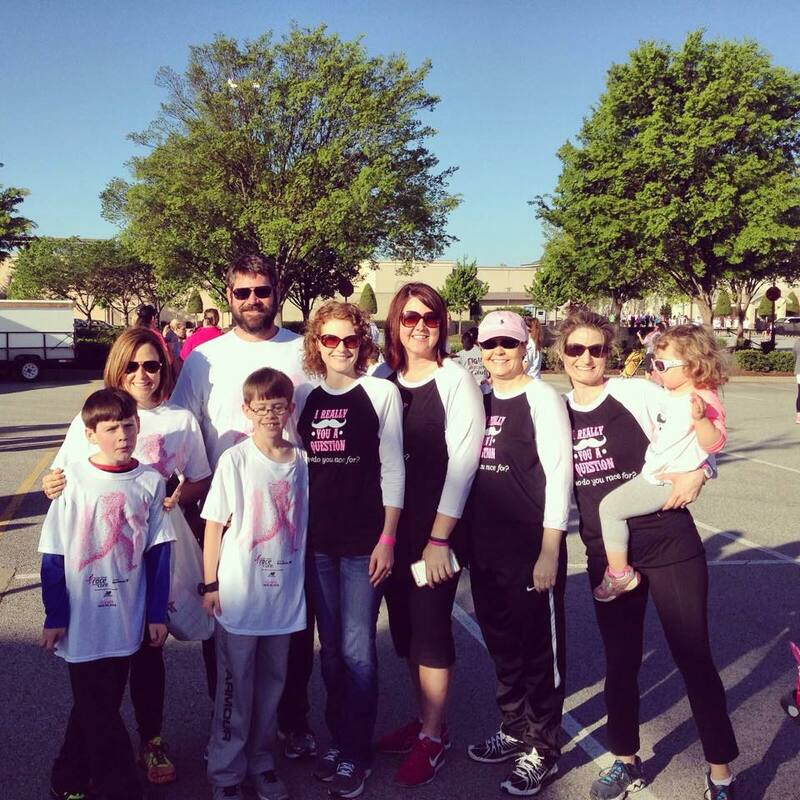 Three years ago, we moved the Team T-Shirt Contest to social media with the winner being chosen through Facebook “likes.” The last two years, Terri’s Troops have won the t-shirt contest and Komen Ozark has decided to name the contest in memory of Terri Walker, the driving force of Terri’s Troops. Terri was diagnosed with Stage 4 Triple Negative Breast Cancer on March 2012 and passed away on July 22, 2014. Terri was an inspiration to anyone who met her. She remained positive throughout all of her treatment. That’s sure what it feels like here in Northwest Arkansas as we gear up for the big day on Saturday! This time of year (and also in October, of course) I enjoy watching people express their support with all manner of pinkness. I like to mentally give Pink Awards. So far, “Most Creative Use of Pink” is the pink cement mixer I spotted on the road last week. “Bravest Use of Pink” goes to Joe here at work, sporting pink trousers for our wear pink day. 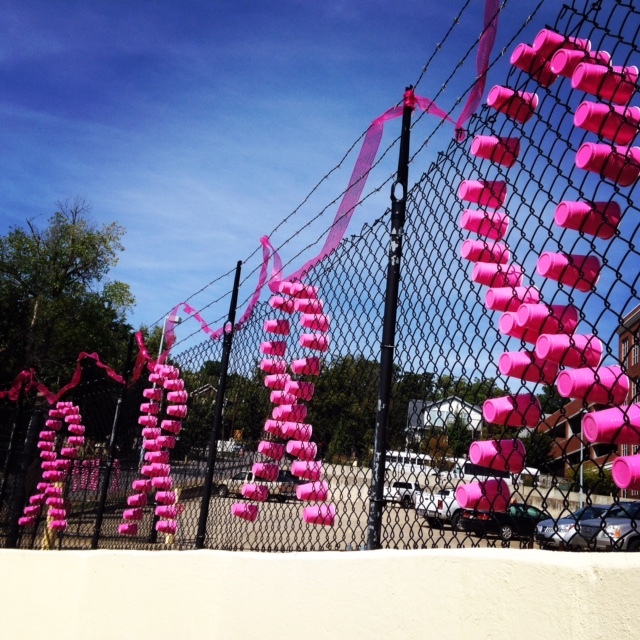 “Most Clever Use of Pink” is yet to be finalized, but the pink cups in the fence at Fayetteville Post Office last October are going to be hard to beat. Aren’t these signs of support incredibly uplifting?! I am so grateful for survivors, co-survivors and supporters who really put themselves out there for the cause. 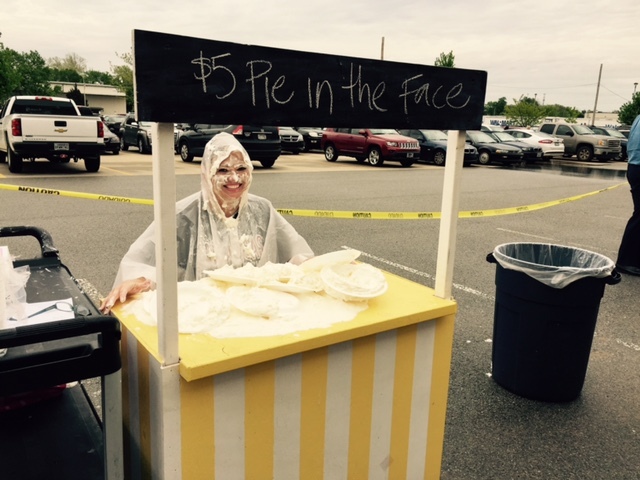 Today at our work building, we had a dunk tank, a pie in the face booth, and ’Que for the Cause (all food donated by Dickie’s!) 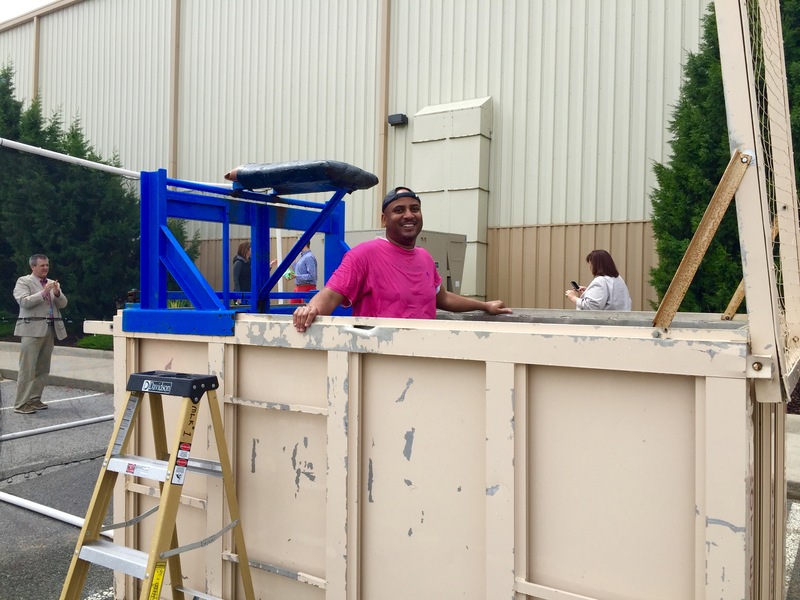 I watched my colleagues climb into a dunk tank (in temperature below 50 degrees!) and goad their teams into spending more money ($5 for three balls or $20 for unlimited) to hurl balls at them and dunk them in that miserable water over and over and over. Brrr! Pies went for $5 each and the whipped cream was flying! I had a blast out in our parking lot (I finally dunked Bruce on about my eighth throw!) I am deeply touched that so many people go to such lengths to support The Cure. I feel the same way about the incredible volunteer army we have pulling off the race!. It looks like the weather may be bad Friday night (perhaps paying it forward for a pretty Saturday?) A heartfelt THANK YOU to the planning and set-up teams who will make our race happens despite rain, wind, and sleep deprivation! On behalf of all survivors…the work you do – the support you provide – makes survivorship easier and brings The Cure closer and closer. 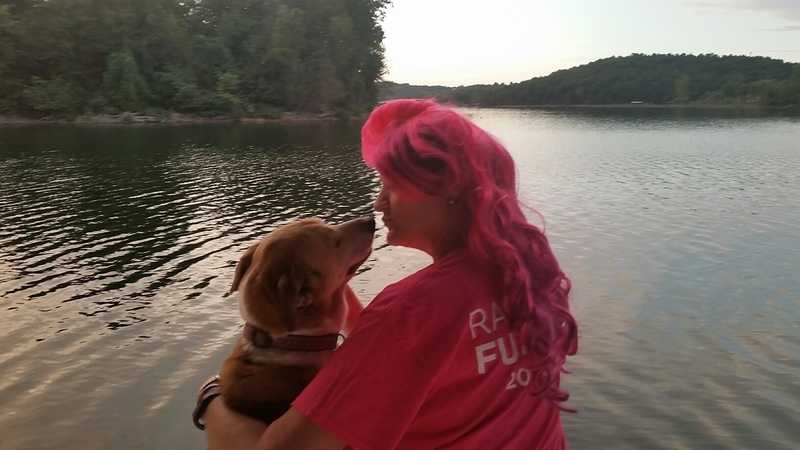 Much love and pinkness…see you at the Race! 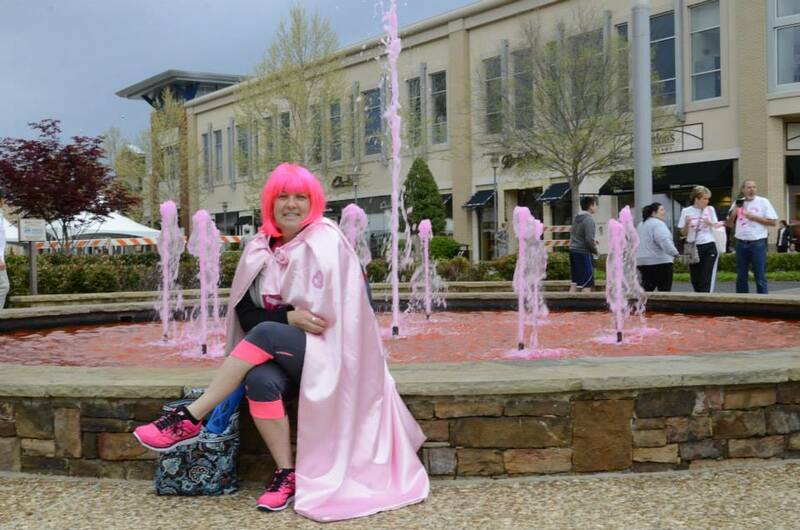 *Our Guest Blogger, Marybeth Cornwell is the Honorary Survivor Chair for the 17th Annual Komen Ozark Race for the Cure. 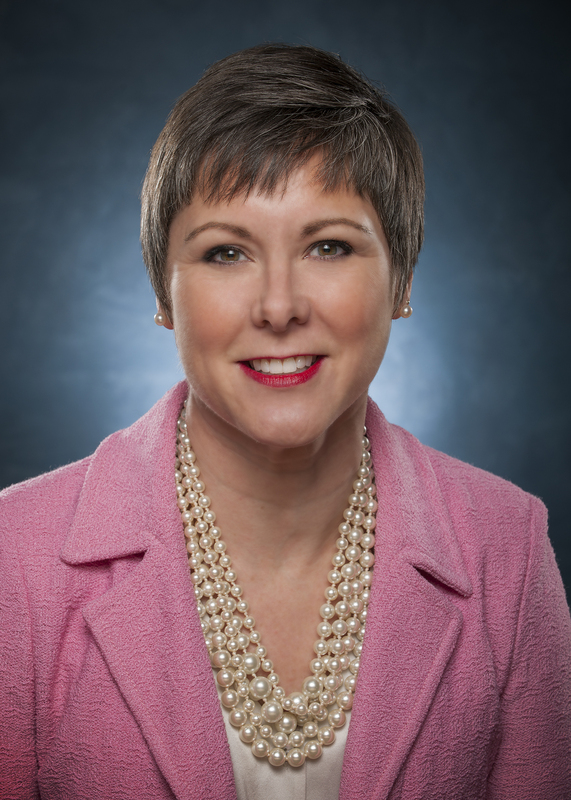 Marybeth is the Senior Vice President of Home for Walmart United States and just celebrated her three year cancerversary. 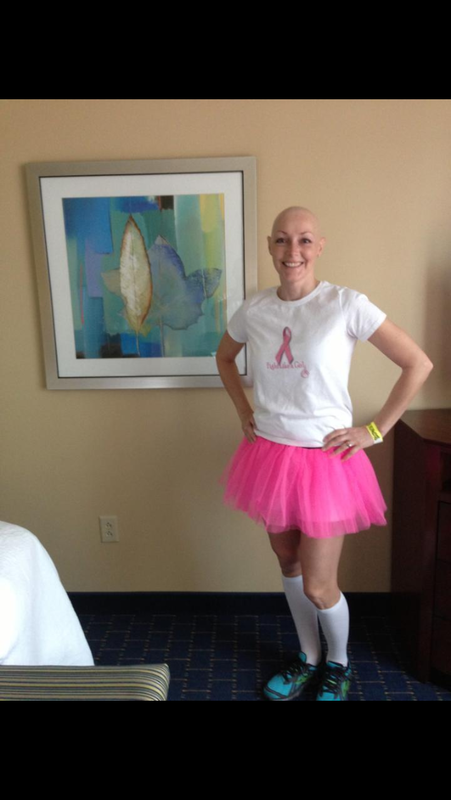 Meet our Honorary Team New Balance Survivor- Tara Ingling! 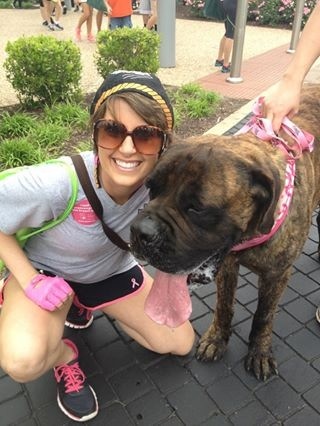 Meet our 2015 Honorary Team New Balance Survivor, Tara Ingling! The Honorary Team New Balance was formed in 1995 to celebrate stories of survival. For each Race for the Cure, the Affiliate has the opportunity to choose a local survivor to be a part of Honorary Team New Balance. These members are honored for their personal perseverance against breast cancer and dedication to raising breast cancer awareness. I was 37 years old, had no family history of breast cancer, and NO risk factors. So why did a voice inside my head continue to tell me I needed to have a mammogram? I asked my OB/GYN for two years to order a baseline mammogram for me, but she felt it was not necessary. Finally, the third year that voice was no longer a whisper so I decided I would not take no for an answer. After several mammograms and a biopsy I was diagnosed with high grade DCIS (aggressive ductal carcinoma in situ). Luckily, my cancer was caught very early and considered to be stage 0 or 1. The fact that I have two young children that need me around for a long time made my decision on how I wanted to treat this cancer pretty simple. I wanted to do what gave me the best survival rate and what would help me to live my life without constantly worrying and looking over my shoulder. I chose to have a double mastectomy with reconstruction. With the support of my amazing husband, family, friends, and an incredible team of doctors, I am proud to say that as of March 21, 2015 I am a two year survivor. There were certainly days that I asked God, “Why me?” But I have tried to turn that around and ask him, “What can I learn from this and how can I help others?” I began volunteering for Susan G. Komen and have met, and hopefully helped, several women newly diagnosed with breast cancer. Along this journey I have met so many amazing and inspiring survivors as well as some women I will forever call my friends. As a dear friend of mine once said, “We should all be so in love with each day.” If you take anything from my story, please live each day with a purpose and never forget to listen when God is speaking to you. I just finished with a training run! I have that smug “uh-huh, I just worked out” feeling. While I am decidedly one of the least authoritative resources, below are tips that got me to my first 5k (RFTC 2014) and to another one right before Thanksgiving. Coming out of winter (ahem) a bit heavier? (I’m lookin’ at you, Tamoxifen. Thanks for those last 10#)….well just remember that a little weight smooths a lot of the cellulite out so you actually look cuter running! My fiancé is Mr. Marathon. I kept my training a secret until we went on Spring Break last year and I had to confess what I was doing. (I am not exactly the hop up and exercise on vaca type. He was starting to get suspicious.) Rick was a HUGE training help (those breathing tips!) not to mention his all around wonderful encouragement. We finished the race hand in hand. -My personal favorite is “5k Runner” from Clear Sky Apps. At a speaking gig recently I heard some fellow survivors raving about the “Zombie, Run! 5k Training” app. They are all about 8 week programs. Whoops, you say you only have 4 weeks? If you can run (or lope or stagger) for 5-8 minutes straight, you can start up somewhere in week 5 and be just fine. -I’ve always been partial to New Balance (bless their hearts, they make narrows!) 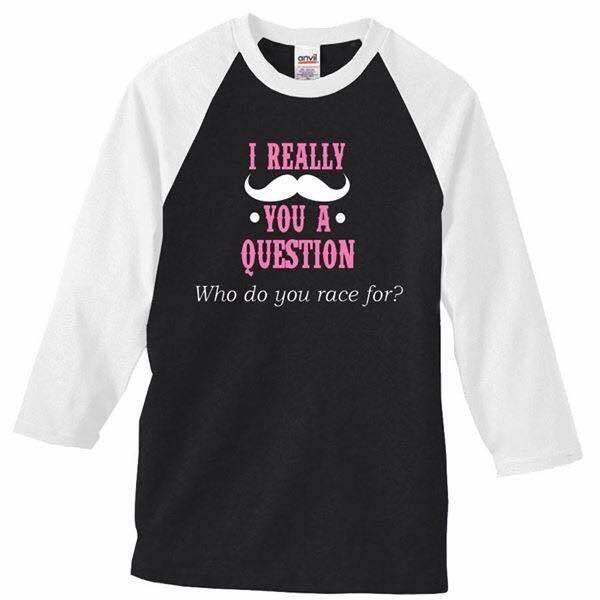 What do you know, they make the official Komen running shoes and some apparel too! Y’all, the shoes are awesome! -At the risk of embarrassing my almost-47-year old self in front of all the cute, hipster Millennials, here are some of my faves. That’s a sampling…I have 103 songs on the playlist. Oh, make that 104…I have to add Pharrell’s “Happy”! -I love my in-ear Bose headphones from Sam’s Club. They have these silicone thingies that fit the inner curve of your ear (comes with three sizes) and prevent the buds from wiggling around or falling out. -I decided last year, that no matter when or where I run, I will Pink It Up! My favorites include (of course) Komen tees and anything from Walmart’s Danskin brand athletic line…performance is awesome and pink is always available! I also love my Komen shoe laces that New Balance gave away at last year’s race. -Train with friends, even if you do it virtually. 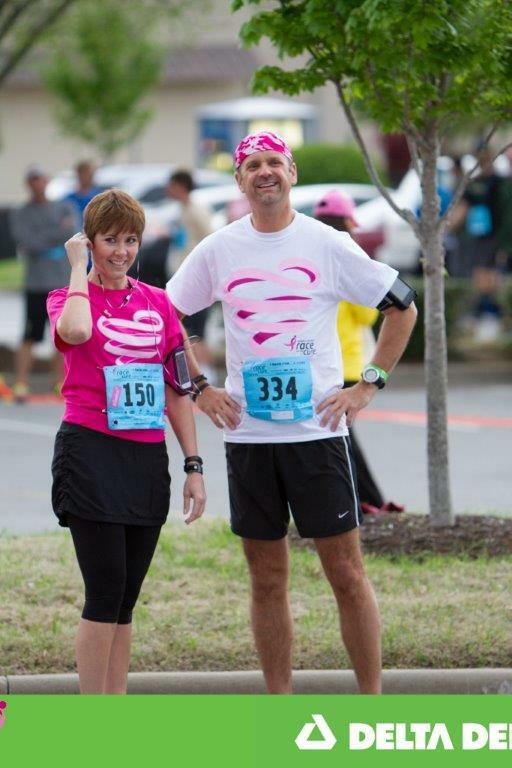 My friend Jodi Foutch and I co-trained entirely by text for the Siloam Springs Turkey Trot last year. We traded inspiration, trash talked, and agonized together over our aging hips. -Tell your friends, family and coworkers that you are training and get them to sponsor you! Remember we need to raise one million dollars. Nothing like a little accountability to get you moving! It’s easy to ask 10 friends for $10, right?! -I read a quote on Pinterest recently that sums it up “Nothing will change until you decide it will.” Last year, I finally decided that I hated cancer more than I hated running. (That is a whole bunch). Every time I want to quit on a training run, I think about seeing all those survivors at our annual RFTC picture. I think of our angel Georgia Sherrill, my BC mentor who was beloved by so many in our community. I think about my first shower after the double mastectomy when as a grown woman, my mother had to scrub me in the tub like the family dog! I am grateful that I can run, if slowly and plenty jiggly…and I just keep going. Survivors, you already kicked cancer. You’ve got this. Supporters and co-survivors, your dedication inspires us! Have you ever noticed that people just don’t know what to say when you share that you are a breast cancer survivor? Or, maybe you are someone who has been in that situation, fumbling for the right words…I know I did before my breast cancer journey. When I started speaking publicly to share my experience, I decided it would be helpful educate others on what to say. …at which point most people share that someone important in their life also had a breast cancer journey. The next time you get info a similar conversation, I challenge you to take the next step and explain why we observe a culture of counting. It’s because from the moment of diagnosis, breast cancer patients are locked in a battle with a diabolical disease. We are in it for life – literally. Breast cancer still has no cure. Let that motivate us as we Participate, Advocate, & Donate for the 1 in 8. Off to train with my running app. See you at the Race! Our Woman Crush Wednesday, Nicole Bagley! 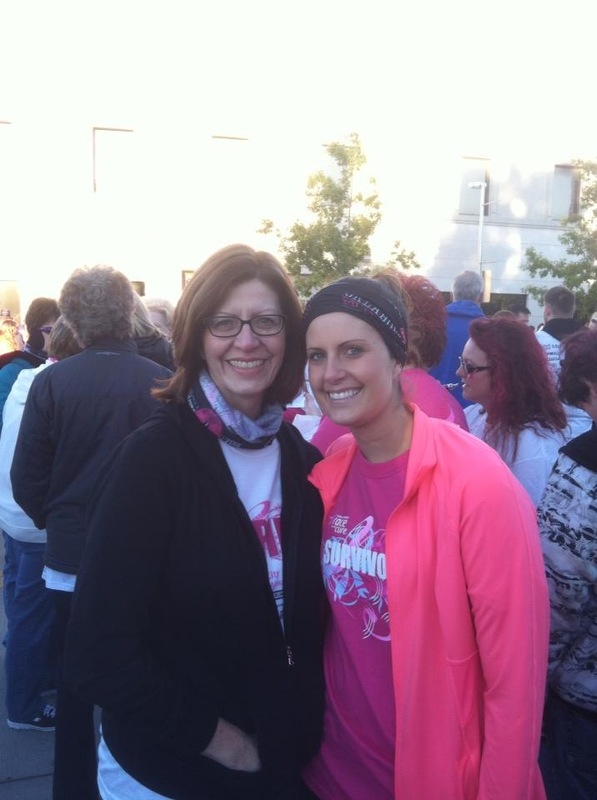 My mom was diagnosed with Inflammatory Breast Cancer at the age of 36. She fought hard for four years and died at the age of 40. She was the first person in our family to have breast cancer that we knew of. In March of 2012 I found a suspicious lump while doing a self-exam. 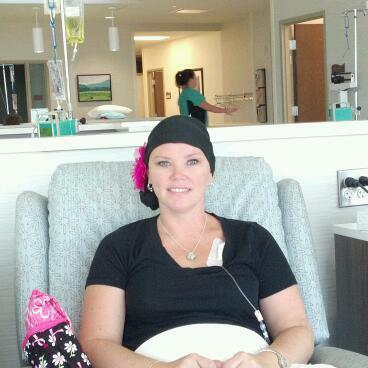 I was diagnosed with stage 3 breast cancer at the age of 34. Later we would find out I also carried the BRCA 2 gene. I underwent bi weekly Chemotherapy for four months, a bilateral mastectomy, a hysterectomy, six and half weeks of radiation and many surgeries. During my battle with breast cancer I was overwhelmed by the love and compassion from my friends, families and even people who I did not even know. 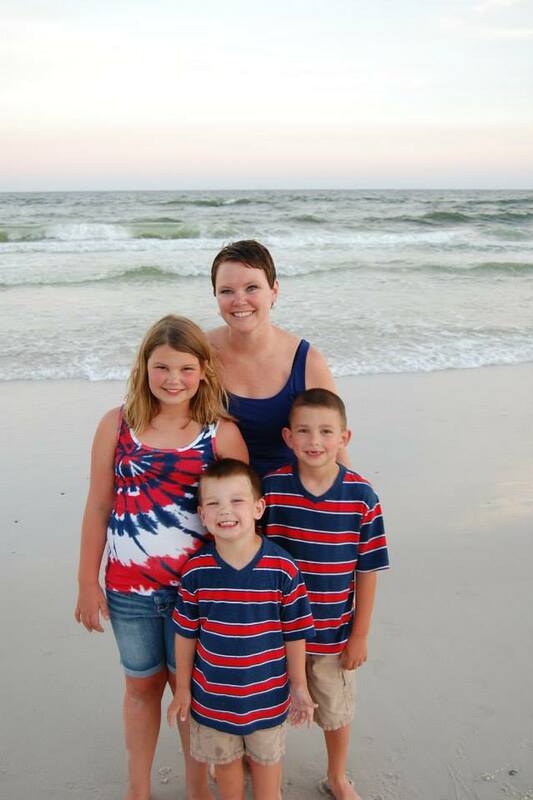 My three kids, my husband and the continuous support was my drive to fight cancer and win. Today I have “no evidence of disease.” I am feeling good and I am living my “new normal” life. 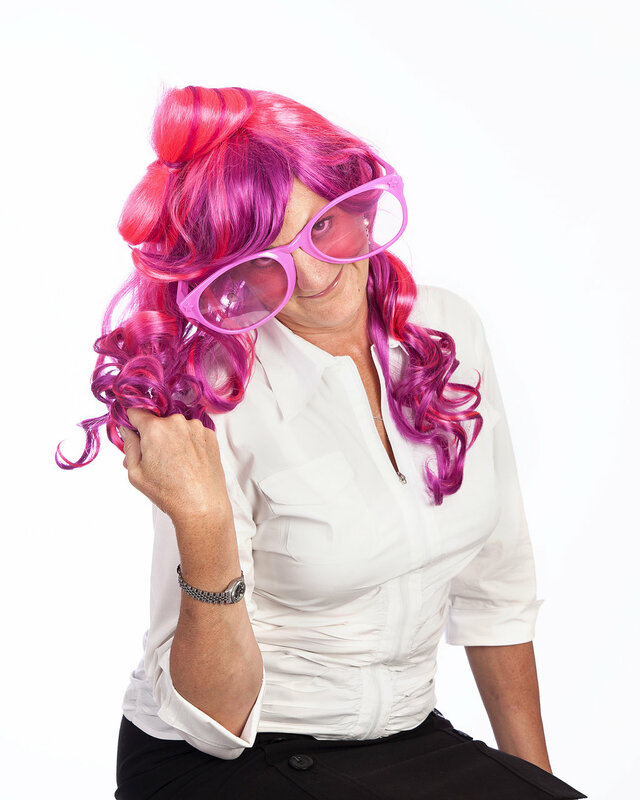 Our Woman Crush Wednesday, Inger Bakaric! Our “Woman Crush Wednesday” today is Inger Bakaric! 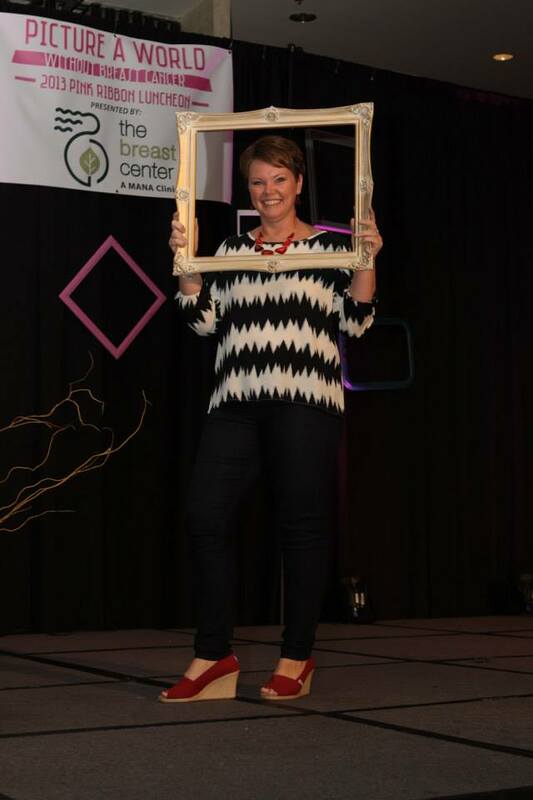 Inger is a one year breast cancer survivor, serves on the Komen Ozark Race for the Cure Steering Committee and is our New Balance Honorary Team Survivor! Honorary Team New Balance was formed in 1995 to celebrate stories of survival and to honor athletes who have made a difference in the fight against breast cancer. For each Race for the Cure, the Affiliate has the opportunity to choose a local survivor to be a part of Honorary Team New Balance. These members are honored for their personal perseverance against breast cancer and dedication to raising breast cancer awareness. In July 2012 I went in for my regularly scheduled mammogram. 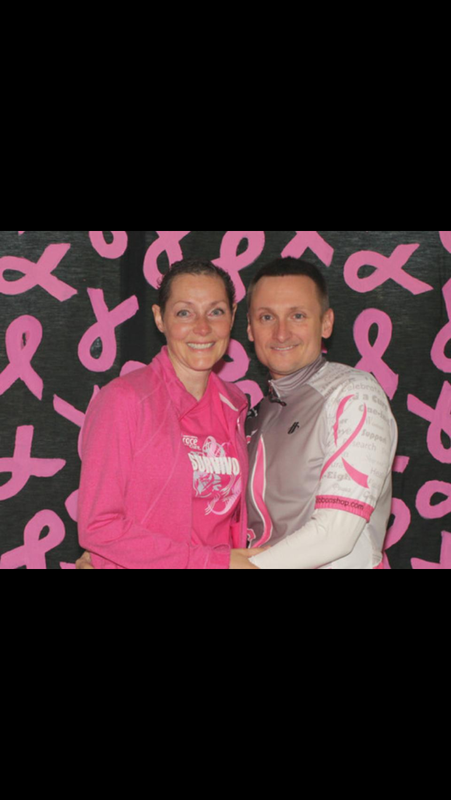 I was a healthy, active 44 year old with no family history of breast cancer. I pointed out a small bump that I had recently found, within 48 hours they confirmed that it was stage 2 breast cancer. It was very close to the skin surface so I underwent 6 rounds of chemo to shrink it away from the skin, followed by a bilateral mastectomy in January and finally reconstruction in May 2013. One of my doctors asked me at our first meeting what I was willing to do to get rid of the cancer, after a long scary pause I said whatever it takes. 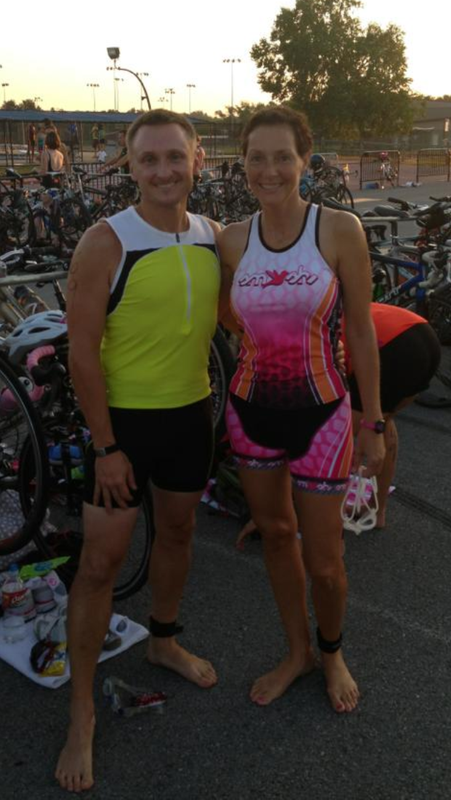 Later I thought about all the things I wanted to do in my life, on the top of my list was complete a sprint triathlon. I decided that as soon as I was able to I would do it, whatever it takes. I had run a 5k but I never thought I would be able to do anything more than that. I stayed as active as I could during chemo and was able to complete a 5k right before my 5th treatment. By the end of February I was able to go to biking class and I started working on getting my strength and endurance up. By April I was training with a beginner triathlon group. It was very hard work, I cried many times upset that my body was not able to work as hard as I wanted it to. 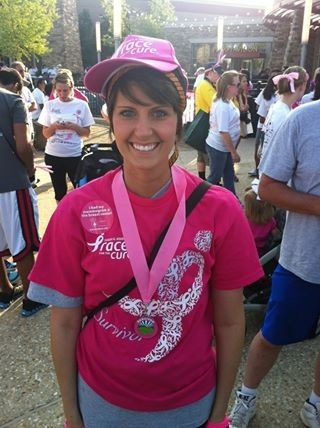 In March I was able to do a bike race, in April I was 2nd survivor in Race for the Cure 5k with my best time ever. In May my first open water swim, and in August I had reached my goal and completed 2 sprint triathlons. I realized that I was stronger than I ever thought I could be. I have since run many more 5k races, my first 10k and my first half marathon placing first in the masters division. I am currently training to compete in another half marathon and a duathlon in March. I decided early on in my treatment that I would not give up, that I would stay positive and I would never quit, and that I would finish what I started whatever it takes. This statement got me through the chemo and the tough days ahead and I still say it to myself anytime I have a hard day. I am so very thankful to my husband Michael who was such a wonderful support for me. He was with me at every doctor appointment; he trained with me and ran by my side during every race cheering me on. I was blessed to have the help of my wonderful friend Jill who among other things sat with me through my first chemo, my daughters Lorelei and Mariana who kept me smiling and helped out whenever I needed anything, my Mom and so many other friends and family that took care of me and kept my spirits up. 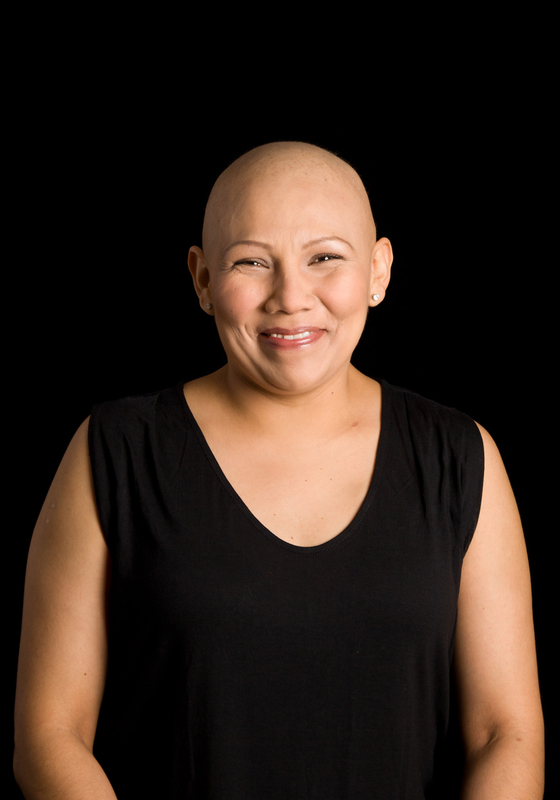 Meet our Featured Survivor, Aracely Falcon! 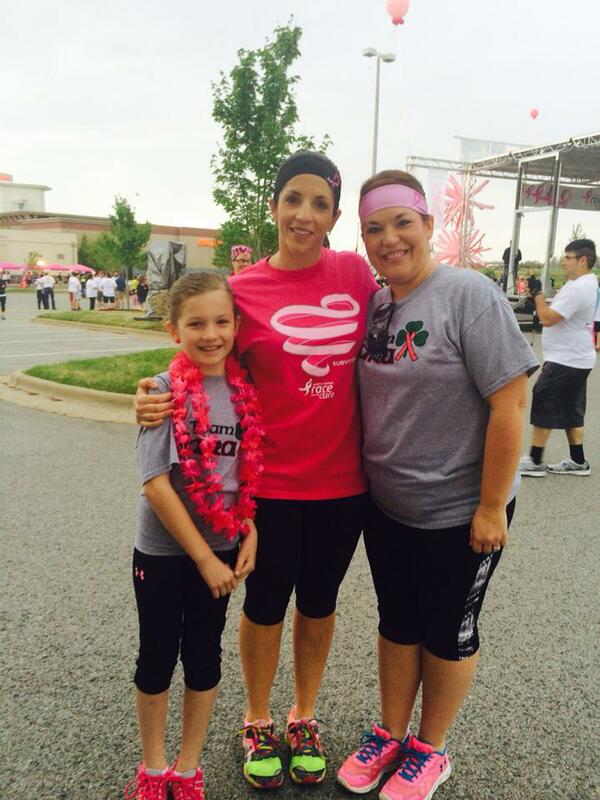 Aracely is a wife and mother of two and at 37 years old found herself with another title, “Breast Cancer Survivor.” Aracely was diagnosed with stage 2 breast cancer more than three months ago. “I found a suspicious sizeable lump on my right breast, and I knew I had to see the doctor. After several screenings, the doctor told us that the results came out positive. At that time the patient navigator interpreted in detail everything in Spanish and then I felt as if my body was floating in the space. I didn’t listen to any sounds, or noises, I was apart from reality by seconds, then my children, my children came to my mind and I said to myself in a matter of seconds, “I was going to be okay, and that I would come out of it fast’. They have been giving me chemotherapy treatments in Highlands in Rogers, AR. Thanks to God I have lots of support from family and friends. But, I also believe that I am very blessed to have found someone that gave me education about breast health and breast cancer in my language and now it can navigate me in the medical system and get connected with several other programs that help women with breast cancer, and these programs are supported by monetary funds from Komen Ozark. When this disease comes to you, you not only worry about your own life, you worry about your family, your children and all the treatment expenses that come with all of this. Susan G. Komen Ozark is doing so much for us, for us the Hispanic women in Northwest Arkansas. With the organization’s support, many lives have been saved, and I want everyone to know about it. Our Woman Crush Wednesday, Melanie Fitts! Melanie Fitts, survivor from Farmington, AR was diagnosed when she was only 24 years old after finding a knot during a self examination. With no family history and testing negative for BRCA Melanie is now working with a doctor in California who does studies on the relationship between cell phones and cancer – her lump was detected in the same spot where she carried her cell during workouts throughout college. Despite many surgeries and hours of radiation, Melanie is positive and works to help other women fight against this terrible disease. Melanie is why we race!